Description: Ideal for aquariums and terrariums. Readings in 0.1 degrees Fahrenheit or Celsius. Temperature range -10 degrees F to 140 degrees F (-23 degrees C to 60 degrees C). Mounting suction cups and battery included. 39 inch long temperature probe cord. Pros: No problems with this thermometer. Cons: I wish it told the humidity levels as well. An online petshop gave this to me free with an order I placed. I still use it!! I bought a thermometer from lowes for $30.00 + and they were .2 to .1 off from each other. These are good if youre just trying to see a general temperature, and not something super accurate. They work, and id use them for single applications if needed. 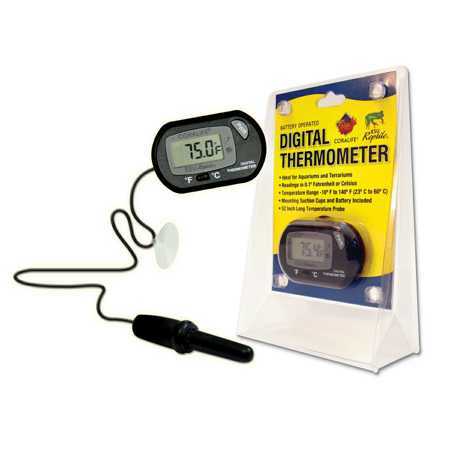 I used to use a lot of these for my geckos and others, until I got a temperature gun- which revealed they were off by anywhere from 5 to 20 degrees, usually reading too low. I think only one of them out of five actually read the right temp within a degree or two. That's outright dangerous. I use it in my fish tank. As long as you don't touch it, you will get a readout. If you bump the sending wire, or move the unit in any way, the screen usually goes blank and sometimes will not readout for a while after wards. This might be a fluke with my particular unit. One must realize compared with life elsewhere in the universe, life on earth is extremely primitive. Our methods, knowledge, and our machines are primitive. Yet, it's easy to feel we have reached the pinnacle of wisdom and knowledge. 1 Corinthians 3:19,20 and Isaiah 55:8,9 are enlightening. Cons: Does not last long. Wire Connection goes bad. Display Deteriorates. Bottom line, these are really great when you first get them, but they don't last long. I have owned several of these thermometers and would like to say that my problems with them were a one time occurrence, but every one that I have owned has gone bad within a few months to a year. The probe connection will go loose and cause the reading to jump around like crazy. Sometimes moving it around and resetting the power will fix it, but its only a matter of time before it happens again. Ive also had trouble with the display disappearing. It come back if you press on the screen or reset the power most of the time. I have only had one of these thermometers last long enough that I needed to replace the battery. I use this to monitor the temp of my tubs in the front or cool end in the racks. Its seems pretty accurate but I always use a temp gun to check everything every couple days. "I'd rather have a German division in front of me than a French one behind me." Gen. George S. Patton, Jr.
As a veteran teacher with more than 37 years of service, and a teacher of the year providing thesis help for my district, I could not agree more! This letter tells the truth! I only hope the public is paying attention, and will begin to vote accordingly. Interesting post! This is really helpful for me. I like it! If you just get started to Hotmail, click hotmail login to create new account.